1. 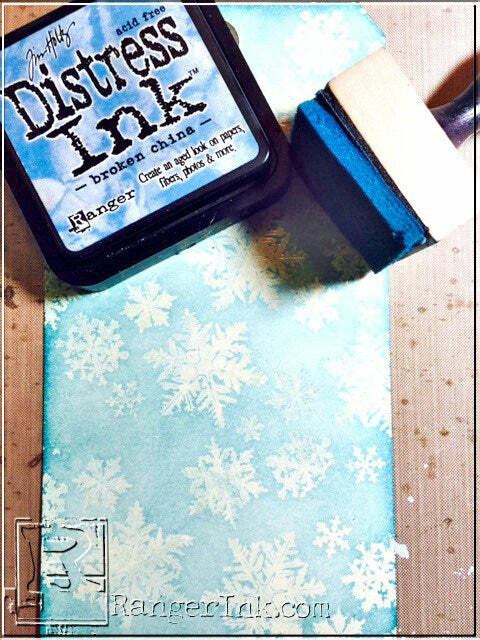 Apply Broken China and Distress Embossing Ink to snowflake stamp. This will give the snowflake a muted color effect. 2. Add Clear Embossing Powder and heat until Powder sets. 3. Then cut the tag down to 4 x 5 1/4. 4. After you have allowed the card front to cool for a minute apply Broken China Distress Ink by blending the ink on to the card front using a blending tool in circular motions. 5. Add a little more around the edges to give it definition. 6. 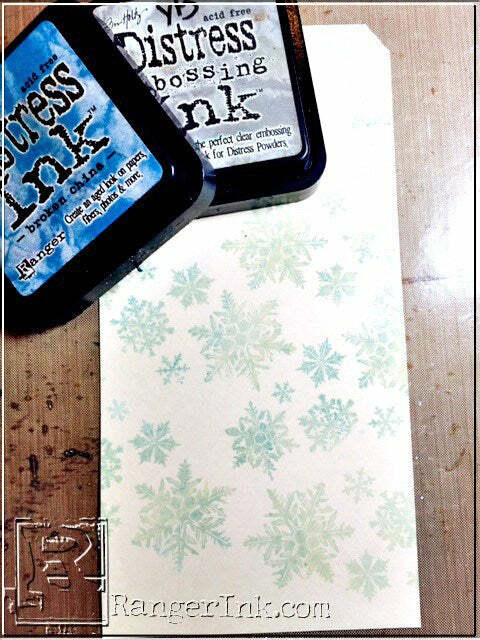 Apply some Broken China Distress Ink onto your Non Stick Craft Sheet. Spritz with water to form small color puddles. 7. Swipe your Crinkle Ribbon through the colored puddles. Scrunch the Ribbon and then dry using your Heat-it Tool. 8. 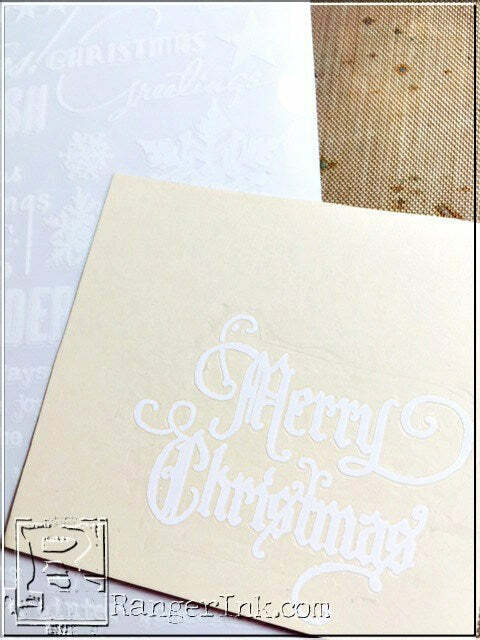 Using a scrap piece of Manila Cardstock apply the Merry Christmas Rubbing. After applying the rubbing blend Broken China Distress Ink over rubbing. Once you have the color the way you want it, spritz a towel with water and lightly rub across rubbing to remove any excess ink. 9. Cut a piece of Stamping Specialty paper to 4 1/4 x 11. Fold in half and then apply Broken China Distress Ink around the edges. 10. 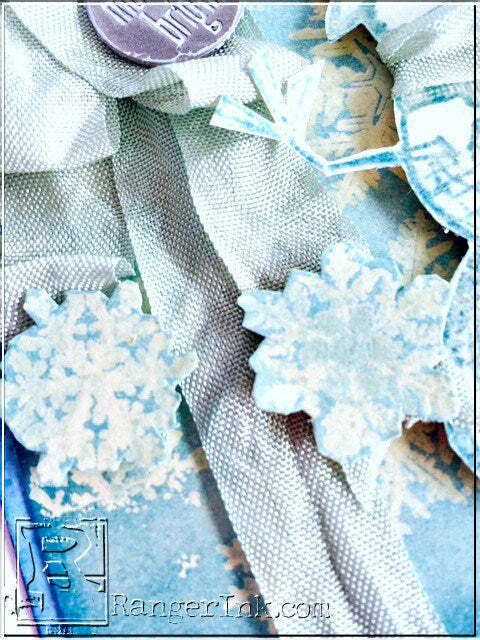 Tie your colored Crinkle ribbon around the left side of the snowflake card. 11. Adhere the Merry Christmas sign to the top right of the card. 12. 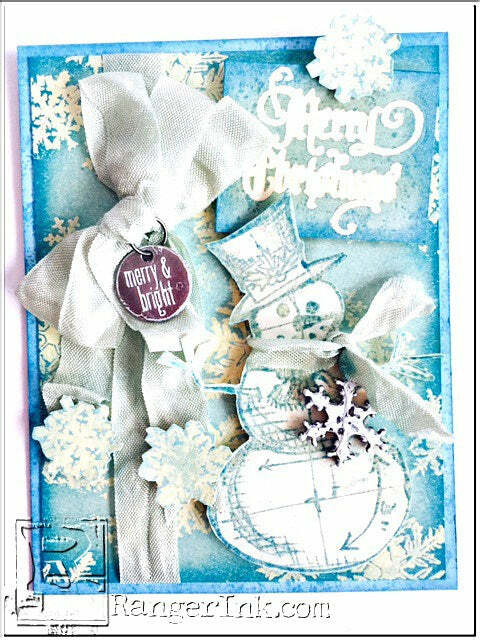 The Snowman was stamped on to Manila Tag using Broken China Distress Ink then embossed with embossing powder. Cut him out. Tie a scrap of Crinkle Ribbon around his neck as a scarf and hang snowflake charm. 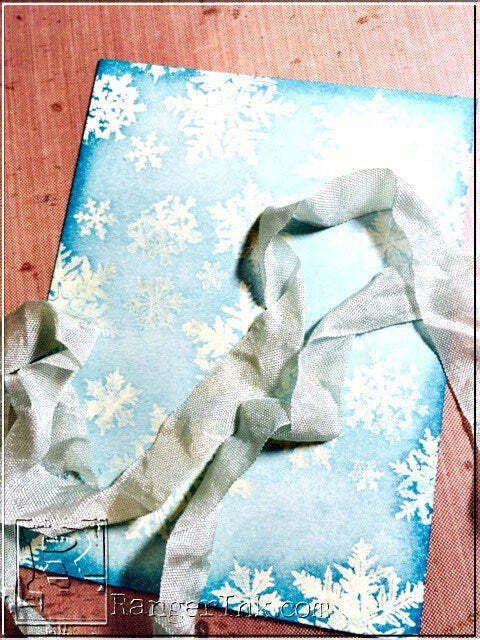 Adhere the Snowman to the card using Ranger Foam Tape. 13. From the scraps left over from the original tag that was cut down for the card front, fussy cut a few snowflakes to use at the ends of the Crinkle Ribbon Bow and on the Merry Christmas sign. Here is a close-up just so you can see the mixed color effect of the snowflakes. I hope this might have inspired you to give Monochromatic Coloration a try. Thank you to Ranger for inviting me to share some inky fun! Yvonne Blair is a Ranger University Grad, Curiosity Crew Member and Designer in the papercrafting industry. She has been on several Design teams and has worked in the industry as a buyer/manager for the last 14 years. Working with Distress Inks, paints, stains etc…is one of her biggest passions. You can find more about her on her blog Life’s Little Details.